You want a crossover that can walk the walk and talk the talk. That’s why it’s a good thing that the 2019 GMC Terrain is more capable than ever before. This compact SUV offers a range of connectivity features, performance abilities, and other systems to make your journey easier and more enjoyable. Continue on to find out what the 2019 GMC Terrain for sale in West Palm Beach offers for your active lifestyle. Choose from three turbocharged engines to power your 2019 GMC Terrain, including the 2.0L gas engine which delivers 252 horsepower and 260 lb.-ft. of torque. When coupled with a 9-speed automatic transmission, this small SUV can haul up to 3,500 lbs. Hitch on the family camper or a trailer full of gear for your next adventure, even if it takes you off the beaten path. The standard Traction Select System allows you to adjust your driving style depending on the road conditions. For everyday work commutes and grocery store runs, front-wheel drive (FWD) mode offers improved fuel efficiency. All-wheel drive (AWD) mode provides optimized traction on dry, wet, and snow-covered roads. Off-road mode gives you the confidence to travel over sand, gravel, and dirt. The 2019 GMC Terrain makes it easy for you and your passengers to stay connected on the road. Available integrated 4G-LTE Wi-Fi offers internet access, so you won’t use data when you send messages or scroll on social media. You can stay connected in the cockpit, too. Just sync your compatible smartphone with the GMC infotainment center to use Apple CarPlay™ or Android Auto™. Advanced voice-recognition technology lets you play music, make phone calls, and more without taking your eyes from the road ahead. The Terrain’s cozy, spacious interior allows everyone to relax across two rows of soft-touch seating. It offers room for up to five passengers to come along for the journey with additional space behind the second row for cargo. If you need more room, easily fold down the 2nd-row seats to access up to 63.3 cu. ft. for all your travel necessities. You can even fit items as long as 8’ in the cabin when you fold down the front passenger seat. 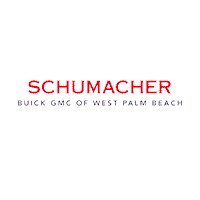 If you’re searching for the Terrain, look no further than Schumacher Buick GMC of West Palm Beach. Stop by today to shop our selection of GMC Terrain trims or browse other new GMC vehicles for sale. Visit our dealership on Okeechobee Blvd or call (561) 283-3957 for more information.